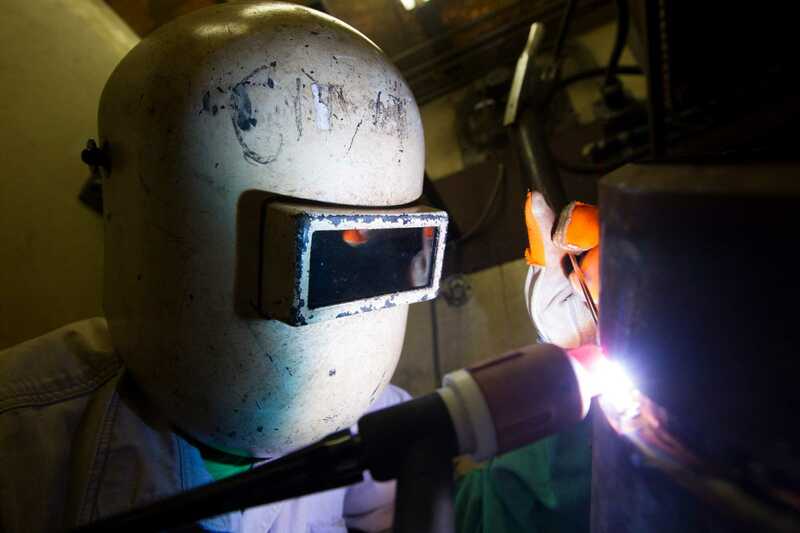 The Byers Technical Institute – Combo Pipe Welding Program is a 40 week/1344 contact hour welding program which includes 23 individual modules that will prepare a student to enter the welding field at the Journeyman level. At the completion of the program the student will take one (1) Structural and (2) Pipe welding AWS certification test. Students successfully completing the program will also receive a Forklift Operator certification, First Aid CPR certification, and a 10-hour OSHA training certification and a Diploma. Objective: To understand welding shop safety rules and use welding/cutting/grinding equipment in a safe manner that protects the student and everyone in the welding shop from injury. Content: The student will receive instruction on rules for the welding shop and classroom environment concerning personal conduct and safety. The instructor will provide explanation and demonstration on the proper use of PPE (Personal Protective Equipment) required in the shop. Specific instruction on the use of hand and power tools will be given and each student will demonstrate the ability to operate each tool safely. Testing: Students will successfully pass a written safety/personal conduct test before being allowed to continue in the program. Objective: To safely set up and operate Oxyacetylene and Plasma cutting equipment and begin using this equipment to prepare various types of metal for the welding process. Content: Students will receive instruction on the safe operation of Oxyacetylene and Plasma cutting equipment using manual and automatic processes. This includes set up and storage of this equipment. Students will demonstrate the ability to cut metal from 3/16” to 1” on plate and pipe. These hands-on skills will be used and developed throughout the duration of the program. Testing: The student must take and pass a written and hands-on test on the safe operation of oxyacetylene/plasma cutting equipment before being allowed to use this equipment for the remainder of the program. Objective: To understand safe work practices using SMAW welding tools and equipment. At the successful completion of this module the student will produce quality multi-pass welds on fillet, lap and square groove welds in all positions using E6010 and E7018 electrodes. Content: This module will introduce students to basic welding terms and definitions as well as understanding the proper setup of power sources and equipment. Students will demonstrate the safe setup and operation of SMAW welding equipment using their Personal Protective Equipment. 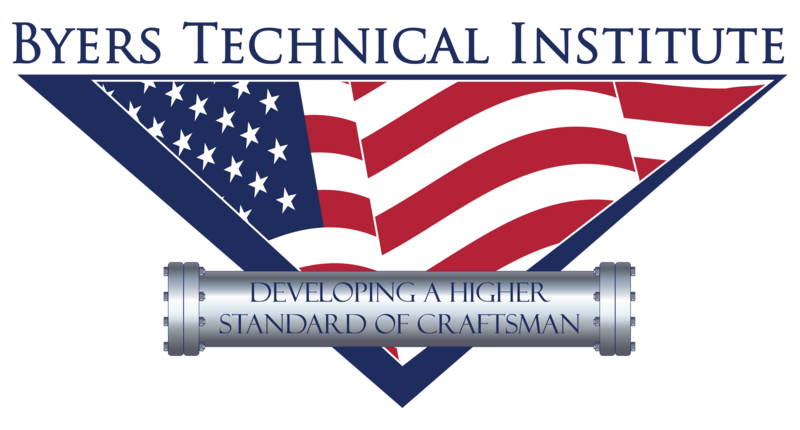 The instructor will introduce the student to various weld joint designs, electrode selection and welding symbols. The student will weld on each of these welding joint designs using E6010 and E7018 welding rods in the Flat, Horizontal, Vertical and Overhead positions. Testing: The student will be given 2 written test and 2 hands-on welding skill test during this module. The welding skill test will be scored by visual and dye-penetrant (PT) examination. Objective: To understand safe work practices using GMAW welding tools and equipment. At the successful completion of this module the student will produce quality multi-pass welds on fillet, lap and square groove welds in all positions using the GMAW process. Content: In this module students will become familiar with the equipment used to produce quality GMAW and FCAW welds. Students will weld on multiple welding joint designs in the Flat, Horizontal, Vertical and Overhead positions. Objective: Produce quality groove welds on ½” and 1” carbon steel with backing using the SMAW process in the Horizontal, Vertical and Overhead positions. Successfully pass a guided bend test with open root 3/8” carbon steel plate using E6010 and E7018 electrodes in the Horizontal, Vertical and Overhead positions. Content: Students will continue to develop their skills with the SMAW process welding on ½” thru 1” single V-groove plate with backing and 3/8” thru ½” open root single V-groove plate. Students will also be introduced to AWS and ASME codes and testing procedures. Testing: Students will be given 2 written test and 2 guided bend test on 1” and 3/8” single V-groove welds using carbon steel plates. Objective: To successfully pass a guided bend test in the 6G position on 6” and 2” carbon steel pipe using E6010 (root) and E7018 (fill). Content: Students will learn to prepare pipe for SMAW welds and weld carbon steel pipe using E6010 and E7018 electrodes in the 2G, 5G, and 6G Positions. Testing: The student will take 1 written and 2 guided bend test on carbon steel pipe in the 6G position. Objective: To understand safe work practices using GTAW welding tools and equipment. At the successful completion of this module the student will produce quality multi-pass welds on fillet, lap and square groove welds in all positions using the GTAW process on carbon steel, stainless steel and aluminum. Content: In this module students will become familiar with the equipment used to produce quality GTAW welds. Students will weld on multiple welding joint designs in the Flat, Horizontal, Vertical positions. Testing: Students will take 2 written and 2 visual hands on GTAW skill test during this module. Objective: Successfully pass a 3/8” open root guided bend test on carbon steel plate in the horizontal, vertical and overhead positions. Content: Students will learn to prepare test coupons for GTAW welding and perform an open root weld using the GTAW process. Testing: Students will be given 1 written test and 1 open root visual and guided bend test on carbon steel plate. Objective: Pass a 2” open root pipe test on carbon steel pipe in the 6G position using the GTAW process. Content: Students will be instructed on preparing pipe coupons for welding with the GTAW process. Open root welds will be made in the 2G, 5G and 6G positions on 6”, 4” and 2” carbon steel pipe. The student will be given 1 written and 1 guided bend test on 2” carbon steel pipe using the GTAW process in the 6G position. Objective: To successfully pass a 2” heavy wall open root pipe test in the 6G position with a GTAW root and SMAW fill. Content: Students will combine the GTAW and SMAW skills to weld on 6”, 4” and 2” heavy wall carbon steel pipe. Testing: The student will be given a 2” carbon steel heavy wall GTAW open root 7018 fill pipe test in the 6G position. Objective: To successfully pass a visual open root weld test on 4” and 2” schedule 10 stainless steel pipe. Content: Students will learn the process of purging stainless steel pipe for welding open root welds on sch. 10 and sch. 40 pipe. Testing: Student will be given a visual open root pipe test in the 6G position on 2” schedule 10 pipe. Objective: To successfully pass an open root guided bend test on carbon steel plate using the GTAW and FCAW process. Content: Students will weld on open root carbon steel plate using the GTAW and FCAW process. To prepare for open root pipe welding using the same process. Testing: Students will be given a guided bend test on carbon steel plate using the GMAW root and FCAW fill process. Objective: To successfully pass an open root 6” carbon steel pipe test using GMAW open root FCAW fill. Content: Students will receive instruction on using the GMAW process to weld open root pipe with a FCAW fill. Testing: The student will be given a guided bend test on carbon steel pipe using the GMAW and FCAW processes. Objective: To successfully produce downhill open root pipe welds in the 5G and 6G positions. Content: In this module students will weld 6” schedule 80 pipe in the 5G and 6G positions using a downhill progression using E7010 electrodes. Students will also become familiar with the fit up and welding methods of the API branch welding test. Testing: Students will be given a hands on welding skill test on 6” sch. 80 carbon steel pipe with E7010 electrodes in the 6G position welding with a downhill progression. This test will be scored by a guided bend and nick break test. Objective: To develop an introductory level of understanding welding symbols, basic lines and views, dimensions and details used in construction and fabrication industries. Content: The student will receive instruction on forms of measurement and a basic overview of fabrication, mechanical and structural drawings. Welding symbols will also be introduced in this module. Testing: The student will be given 1 written test in this module. Objective: To understand the various types of weld inspection and to have the information needed to interpret and weld according to a specific written welding procedure. Content: Introduction of Visual, PT, MT, UT and Radiographic testing of welds. Review the contents and purpose of a written welding procedure. Testing: The student will be given 1 written test during this module. Objective: To develop a basic understanding of Ferrous and Nonferrous metals and their welding ability. Content: In this module the student will gain an understanding of heat input and heat affected zones due to welding as well as the effects of moisture in Carbon and low alloy steels and how they are affected. The identification of various metals and the purpose of stress relieving of welds will also be introduced. Testing: The student will receive on written test in this module. Objective: To develop an understanding of mechanical, structural and fabrication drawings and to become familiar with various piping and structural systems. Content: The student will develop the math skills necessary to succeed in the construction and fabrication industry as well as become confident in understanding drawing details, notes, specifications, dimensions and section views of mechanical and structural drawings. Various piping and structural support systems will be introduced in this module. This information will be expanded on in the Pipe/Structural Fitting module. Testing: The student will be given 2 written test during this module. Objective: To understand basic rigging equipment and how to use this equipment safely. Content: During this module the student will learn basic rigging techniques and the equipment necessary to safely perform these operations. Hand signals for crane flagging will introduced in this module. Testing: Students will take 1 written test during this module. Objective: To weld and fit pipe and structural supports in a simulated industrial/commercial environment. Content: Students will spend 4 weeks using the skills learned in previous modules to read drawings, take measurements, fit weld and install pipe and supports in realistic industrial/commercial conditions. Special attention will be given to working safely and following specific instructions given by a supervisor. The math, blueprint reading, cutting and rigging skills will be used to complete this module. Testing: One combined written and hands-on fitting/welding test will be given during this module. Objective: To safely operate industrial and extended boom forklifts on a jobsite. Content: A certified forklift instructor will give 8 hours of forklift operations instruction using textbook, video and hands-on instruction. Testing: One written and one hands-on examination will be given and certificate and operator's card will be given to students who successfully pass this module. Objective: To become certified in First Aid and CPR. Content: A certified CPR and First Aid instructor will give students the current course necessary to become certified in each skill. Testing: The student must pass a written and hands-on test for each skill to receive their certification. Content: An OSHA authorized construction trainer will give the OSHA 1926 for construction training class. Testing: Students will receive the required written test in accordance with OSHA training requirements.